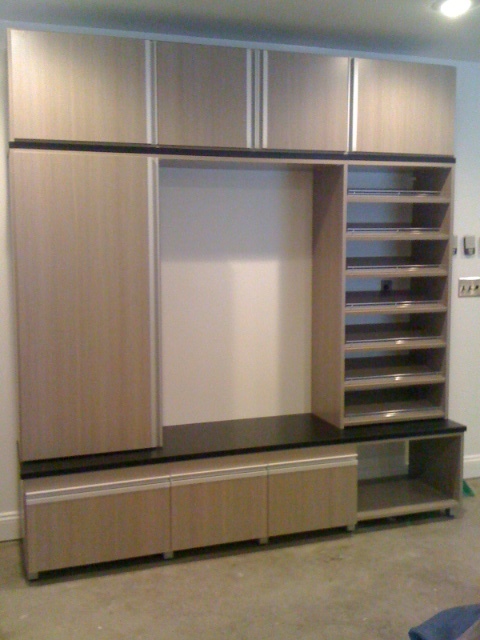 Hoosier Closets recently installed this gorgeous garage entry unit. Our customer told us they like to leave their shoes outside the home, so we designed shoe shelves with chrome fences right at the door for easy storage and retrieval. And, the design included a bench to make it easy to sit down while dealing with shoes. Underneath the shoe shelves is an open area for winter boots. Three drawers were added at the bottom of the unit to hold toys, winter gloves and the like. A tall cabinet to the left has adjustable shelving that will hold pantry overflow (extra paper goods, cases of drinks, etc.) In the summer, a cooler, picnic blanket and swimming gear will be placed here for easy retrieval. Above the unit, we designed tall shelves for off-season storage. Right now, winter items can be placed up and out of the way. We loved the driftwood finish with the black accents at the top and bottom. This was by far one of our favorite garage entry installations!